No prettier ode to British motorcycles and the Royal Enfield in particular has been written than K.C. 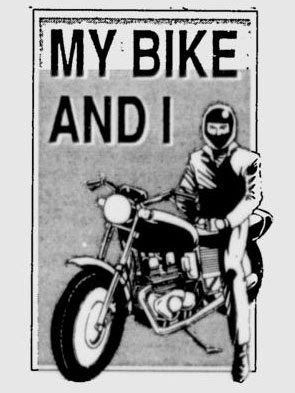 Hong's column, "My Bike And I," in the The New Sunday Times of peninsular Malaysia on Feb. 17, 1991. It's entitled "Memories Are Made of These" and you can read it at this link. The piece is the kind of gentle reminiscence once favored in Sunday newspapers the world over, recalling some imagined better time — this one in the late 1940s, when British motorcycles, the envy of the world, danced before a young man's eyes. Far from their native land, the motorcycles nevertheless spoke a universal language, and were appreciated in independent countries that might have otherwise despised the Empire that had brought them to their shores. Royal Enfield is just one brand of many the author remembers fondly. "Nam Teik Company owned by the late Mr. Lau Hun Chiong sold the Royal Enfields. The single 350cc Royal Enfield Bullet sold fairly well (these machines are still made in India today). "A ponderous machine the Bullet could amble like a circus-horse at five mph on its fourth gear without jerking. Like the Matchless motorcycle it had a mellifluous exhaust note. "In 1979 I took a taxi from Madras Harbour to the Ashoka Hotel. I thought I heard something very familiar. Sat up to see. Oh, man alive! The sound and sight of a gleaming Royal Enfield Bullet made the same way it was made in the late '40s. "I told the cab man, Mahboob, to follow the bike. Looking at the bike made me young again. A darn good feeling. As we turned to get to the hotel I watched the bike move away. "Happiness is the harvest of a quiet eye..."
That was sweet...how in the WORLD did you find that article? Thank you. I love to look through the Google newspaper archive for items.